Right as I was enjoying wearing boots and sweatshirts, an ungodly heat wave hit San Francisco. On a Monday afternoon, people flocked to the parks to picnic and schools kids complained about having to go to school right as the San Francisco summer finally got started. A run along Ocean Beach saw large clumps of people playing in the waves and cars overfilling the lots along the Great Highway. At midnight, I climbed to the top of Bernal Hill and walked out along Pier 1 with some old friends — all without long pants or a scarf, which is my standard get-up in this city. This morning I stumbled out of bed, still in pajama boxers and my hair sticking every which way, and out the front door to take pictures in the gentle morning sun. In a couple of hours, the hot, dry sun will be beating down and I’ll have started a run along the tide line, hopefully barefoot, if I can find someone to shuttle my shoes around the city. Or maybe I’ll wait to run until the evening and cross the peak of Diamond Heights as the fog rolls in, when you can barely see three feet in front of you. As you climb to the peak, the air seems to thin and the wind comes from all directions, its cold blasts spurring you down the hill on the other side. Today, the day is temperamental, summer one moment and the perfect misty setting for a horror film the next. But as I settle in to write, it is still morning and I am back in the house. I’ve poured myself a tall glass of iced tea with a kick of mint and made open-faced sandwiches with juicy heirloom tomatoes that were just waiting to be sliced. Ah, summer. These browned butter cookies pair just as well with iced tea as they do with a cup of hot tea. And with the weather changing every day, I keep a roll of cookie dough in the fridge, so that I am ready to bake off a couple when the winds change. Nutty and sandy, with a touch of sea salt on top, these cookies bring to mind summer days collecting sand dollars, with your toes in the wet sand and the harsh coastal wind in your face. I made these shortbread cookies for this month’s Sugar High Friday, hosted by Elissa at 17 and Baking. Elissa picked browned butter or beurre noisette as the theme of the month, you can see all the details on her blog. Sugar High Fridays were started by Jennifer at The Domestic Goddess. This is the first time that I am partaking in the group challenge. Cream the butters and sugar together. Then add the vanilla, and slowly add the flour and kosher salt. Shape the dough into a log and refrigerate for at least half an hour. Preheat oven to 350F. Cut slices of the log approximately 1/4 inch thick and put cookies onto parchment-lined baking sheets. Bake for 15 to 20 minutes until the edges are browned. After removing from the oven sprinkle each of the cookies with a touch of fleur de sel. 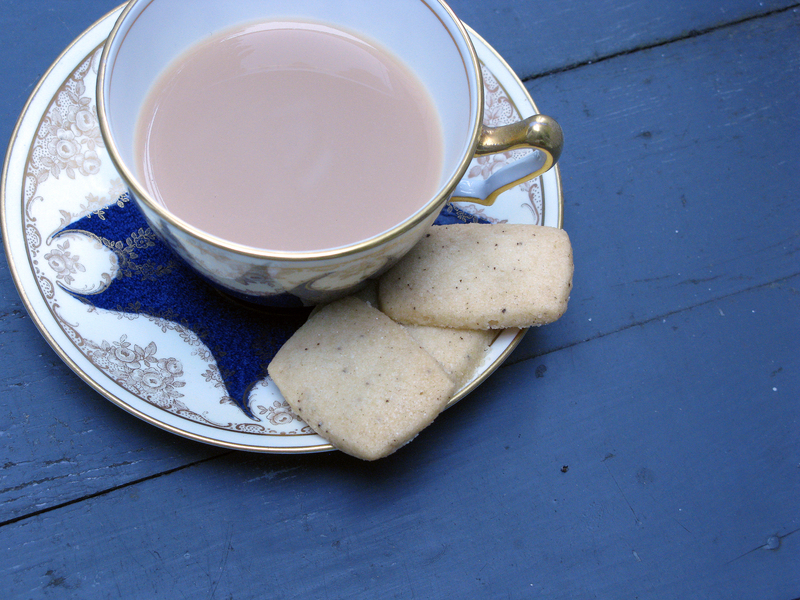 You are currently reading SHF: Salted Browned Butter Shortbread at Soufflé Days.